Most investigations of biogeochemically important microbes have focused on plastic (short-term) phenotypic responses in the absence of genetic change, whereas few have investigated adaptive (long-term) responses. However, no studies to date have investigated the molecular progression underlying the transition from plasticity to adaptation under elevated CO2 for a marine nitrogen-fixer. To address this gap, we cultured the globally important cyanobacterium Trichodesmium at both low and high CO2 for 4.5 y, followed by reciprocal transplantation experiments to test for adaptation. Intriguingly, fitness actually increased in all high-CO2 adapted cell lines in the ancestral environment upon reciprocal transplantation. By leveraging coordinated phenotypic and transcriptomic profiles, we identified expression changes and pathway enrichments that rapidly responded to elevated CO2 and were maintained upon adaptation, providing strong evidence for genetic assimilation. These candidate genes and pathways included those involved in photosystems, transcriptional regulation, cell signaling, carbon/nitrogen storage, and energy metabolism. Conversely, significant changes in specific sigma factor expression were only observed upon adaptation. These data reveal genetic assimilation as a potentially adaptive response of Trichodesmium and importantly elucidate underlying metabolic pathways paralleling the fixation of the plastic phenotype upon adaptation, thereby contributing to the few available data demonstrating genetic assimilation in microbial photoautotrophs. These molecular insights are thus critical for identifying pathways under selection as drivers in plasticity and adaptation. Nitrogen fixation by cyanobacteria supplies critical bioavailable nitrogen to marine ecosystems worldwide; however, field and lab data have demonstrated it to be limited by iron, phosphorus and/or CO2. To address unknown future interactions among these factors, we grew the nitrogen-fixing cyanobacterium Trichodesmium for 1 year under Fe/P co-limitation following 7 years of both low and high CO2 selection. Fe/P co-limited cell lines demonstrated a complex cellular response including increased growth rates, broad proteome restructuring and cell size reductions relative to steady-state growth limited by either Fe or P alone. Fe/P co-limitation increased abundance of a protein containing a conserved domain previously implicated in cell size regulation, suggesting a similar role in Trichodesmium. Increased CO2 further induced nutrient-limited proteome shifts in widespread core metabolisms. Our results thus suggest that N2-fixing microbes may be significantly impacted by interactions between elevated CO2 and nutrient limitation, with broad implications for global biogeochemical cycles in the future ocean. Nitrogen fixation by filamentous cyanobacteria supplies significant amounts of new nitrogen (N) to the Baltic Sea. This balances N loss processes such as denitrification and anammox, and forms an important N source supporting primary and secondary production in N-limited post-spring bloom plankton communities. Laboratory studies suggest that filamentous diazotrophic cyanobacteria growth and N2-fixation rates are sensitive to ocean acidification, with potential implications for new N supply to the Baltic Sea. In this study, our aim was to assess the effect of ocean acidification on diazotroph growth and activity as well as the contribution of diazotrophically fixed N to N supply in a natural plankton assemblage. We enclosed a natural plankton community in a summer season in the Baltic Sea near the entrance to the Gulf of Finland in six large-scale mesocosms (volume ∼ 55 m3) and manipulated fCO2 over a range relevant for projected ocean acidification by the end of this century (average treatment fCO2: 365–1231 µatm). The direct response of diazotroph growth and activity was followed in the mesocosms over a 47 day study period during N-limited growth in the summer plankton community. Diazotrophic filamentous cyanobacteria abundance throughout the study period and N2-fixation rates (determined only until day 21 due to subsequent use of contaminated commercial 15N-N2 gas stocks) remained low. Thus estimated new N inputs from diazotrophy were too low to relieve N limitation and stimulate a summer phytoplankton bloom. Instead, regeneration of organic N sources likely sustained growth in the plankton community. We could not detect significant CO2-related differences in neither inorganic nor organic N pool sizes, or particulate matter N : P stoichiometry. Additionally, no significant effect of elevated CO2 on diazotroph activity was observed. Therefore, ocean acidification had no observable impact on N cycling or biogeochemistry in this N-limited, post-spring bloom plankton assemblage in the Baltic Sea. Anthropogenic CO2 emissions are causing oceans to become more acidic, with consequences for all marine life including microorganisms. Studies reveal that from the microbes that occupy the open ocean to those intimately associated with their invertebrate hosts, changing ocean chemistry will alter the critical functions of these important organisms. Our current understanding indicates that bacterial communities associated with their host will shift as pH drops by another 0.2-0.4 units over the next 100 years. It is unclear what impacts this will have for host health, however increased vulnerability to disease seems likely for those associated with reef corals. 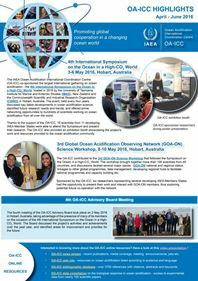 Natural CO2 seeps have provided a unique setting for the study of microbial communities under OA in situ, where shifts in the bacterial communities associated with corals at the seep are correlated with a decline in abundance of the associated coral species. Changes to global biogeochemical cycles also appear likely as photosynthesis and nitrogen fixation by pelagic microbes becomes enhanced under low pH conditions. However, recent long-term studies have shown that pelagic microbes are also capable of evolutionary adaptation, with some physiological responses to a decline in pH restored after hundreds of generations at high pCO2 levels. 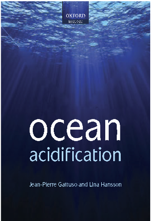 The impacts of ocean acidification (OA) also will not work in isolation, thus synergistic interactions with other potential stressors, such as rising seawater temperatures, will likely exacerbate the microbial response to OA. This review discusses our existing understanding of the impacts of OA on both pelagic and host-associated marine microbial communities, whilst highlighting the importance of controlled laboratory studies and in situ experiments, to fill the current gaps in our knowledge.